A UK-based investor consortium has approached the Kremlin with an offer to bail out troubled oil giant Yukos. The group led by Konstantin Kagalovsky has proposed to buy shares from the firm's ex-head Mikhail Khodorkovsky who is charged with fraud and tax evasion. Yukos has warned it could go bankrupt after a Moscow court ordered it to pay back-taxes of $3.4bn (£1.8bn). The Kremlin has not commented on the offer and is presently showing no signs of wanting to strike a deal with Yukos. 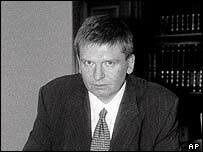 Mr Kagalovsky is a former Yukos official who lives in Britain. "The investors want to make money on the fact that, if the company has no debts, its capitalisation will go up," he told Reuters news agency. "It's a normal financial investment." The investors have not said how much money they would be prepared to put forward but say they have sufficient funds for the bid. But analysts say the offer has as much chance of success as previous bids which came to nothing. There would be "no surprise" if these latest proposals "meet a similar fate," UFG brokerage said in a research note. 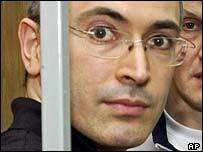 The Yukos case is widely seen as a Kremlin-inspired drive to punish Mr Khodorkovsky for funding opposition political parties and to deter him further political activity. Yukos says it may have to declare itself bankrupt if the authorities carry out a forced sale of its production unit. Shares in Yukos plummeted this week after the government announced the forced sale of its Yugansk unit which produces 60% of the group's oil output. But they rose by more than 2% on Friday amid relief that the company has not yet filed for bankruptcy. Yukos fears that the Yugansk concern will be sold for a price far below its market value - the division has reserves valued at $30.4bn. The firm said the choice of Yugansk as a sales target was "perplexing" given that its reserves were worth so much more than the $3.4bn in taxes for 2000 the court has ordered it to pay. Analysts are concerned the sale would amount to a giveaway to a company close to the Kremlin. Mr Khodorkovsky has suggested in the past that his shares and those of his close associates in the firm could be sold to pay the tax bill. Yukos has said it does not have enough cash to pay the bill, particularly as its assets remain frozen. It has suggested to the government that it might be allowed to pay the money owed over two years. Yukos pumps 1.7 million barrels of oil a day, or 20% of the output from Russia.